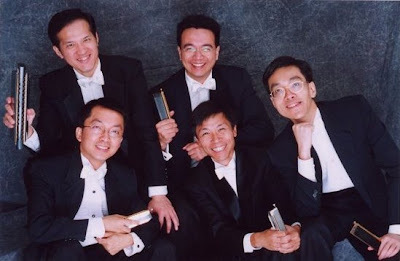 We are a unique group of 5 amateur harmonica players, trying to push the limit of the art of harmonica playing through the performance of string quartets and classical ensemble works arranged for 5 harmonicas by ourselves as well as encouraging composition of original works for harmonica ensemble and other musical instruments. Please explore this site to learn more about what we are doing and how we sound. If you have a question about us, please check the Frequently Asked Questions section first. We would be grateful if you can tell us what you think about us and about the development of the art of harmonica playing in general, by sending us a email at comment@khq.hk. Enjoy!